Pancreatic Cancer Action are so excited to announce the launch of our new Turn it Purple Pharmacy of the Year Award which encourages pharmacies across the UK to raise much needed awareness of pancreatic cancer. Every November, pharmacies across the UK take part in the ‘Turn it Purple’ campaign for Pancreatic Cancer Awareness Month. To recognise the amazing work pharmacy’s do every year to raise awareness of pancreatic cancer, Pancreatic Cancer Action are awarding one pharmacy with the Turn it Purple Pharmacy of the Year Award. Pharmacists and their support staff are well placed to identify key signs and symptoms of pancreatic cancer by engaging with patients and by the medications prescribed and bought over the counter. They are also readily available to offer advice and expertise to patients and can refer them to their GP if necessary. Pancreatic Cancer Action strongly believe that pharmacy teams have a vital role to play in the early detection of pancreatic cancer and have developed the very first e- learning module for pharmacy teams to help diagnose pancreatic cancer. The Award will be given to the pharmacy team that demonstrates the best commitment to both raising awareness of pancreatic cancer amongst their local community and furthering their own education on pancreatic cancer by taking the e-learning module. 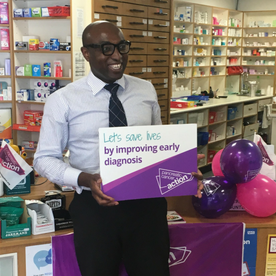 Last year, Bedminster Pharmacy, Bristol, took part in the campaign and their lead pharmacist, Ade Williams, was so impressed with the campaign and the charities commitment to pharmacy that he is now our newest Ambassador. The pharmacy team were also made honorary winners of Turn it Purple 2017 and are the inspiration for this years Award. Pancreatic cancer has the lowest survival rate of all common cancers; less than 7% of patients survive five years and this figure has not changed in almost 50 years. New research predicts that by 2025 deaths from the disease will be 25% higher than breast cancer. If you are a pharmacy and would like to find out more about the Turn it Purple Pharmacy of the Year Award and order your free pack, please click here.